Nokia will bring the first of several Lumia smartphones to China starting in April, as the company moves to reclaim its share in a key market where Android handsets have begun to dominate. The company has partnered with China Telecom to begin selling its Lumia 800c smartphone early next month, Nokia CEO Stephen Elop said during a Wednesday event to introduce its Lumia devices. Nokia also plans to sell its Lumia 900, Lumia 710 and Lumia 610c in China during this year's second quarter and will make its Lumia phones available with the country's two other mobile operators, China Mobile and China Unicom, some time in the future. Nokia has already released the Lumia 800 in European markets. But the Lumia 800c is built specifically for China Telecom's CDMA (Code-Divison Multiple Access) network, and includes a 1.4 GHz processor, a 3.7-inch touch screen, and an 8 megapixel camera. The Lumia 800c will be priced at no-contract for $570. The Lumia smartphones could give Nokia a much needed comeback in China, which is expected to become the world's largest smartphone market this year. In last year's fourth quarter, the company had a 20 percent share of the country's smartphone market, down from the 42 percent it had in the first quarter, according to CK Lu, an analyst with research firm Gartner. "The rise of Android use in China has been very high. Nokia's Symbian platform cannot keep the pace with market growth," he said. Many Chinese users, however, like the Nokia brand, Lu said. The company also has a strong sales channels in the country and has shown in the past it can localize its products in a way that appeals to consumers. "I think they have an opportunity in the Chinese market," he said. "People remember the brand and people are waiting for good products." On Wednesday, Nokia's CEO called China a leading market for the company and noted that Nokia was rebuilding its foundation after having undergone a period of transition. Nokia's Lumia phones debuted last year and were the company's first handsets to use the Windows Phone operating system. The company's Lumia phones for China feature Nokia's own software including online maps, driving navigation and a music service, which will offer free downloads to songs for users during the first 12 months. Nokia has also partnered with leading Chinese Internet firms including Sina, Renren and Tencent to bring their services to the devices. "I think we are doing very well in localizing our products," said Nokia executive vice president of global sales Colin Giles in an interview with journalists. "We believe this is something we bring much better than the competition." Nokia's launch event also signals the first wave of Windows Phone 7.5 handsets that will arrive in China. 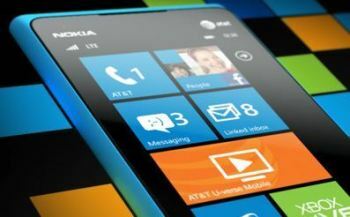 Other handset makers including HTC, Samsung and ZTE will also launch Windows Phone 7 smartphones in the country, according to Microsoft. Last year, Google's Android OS had a 56 percent share of China's smartphone market, according to research firm Canalys. Nokia's Symbian and S60 operating systems were second with a 31 percent share, while Apple's iOS had a 9 percent share. To promote its Lumia smartphones, Nokia will soon launch a major marketing push in China. Nokia noted it had 200,000 retail outlets in the country, which include its own stores and booths inside larger electronic markets. "The secret for us is to get the product into people's hands," Giles said. "Then people will really start to like the device."